The Nintendo 3DS is the successor to the Nintendo DS produced by Nintendo. One of the console's primary features is the 3D visual screen, which displays auto-stereoscopic images to create the illusion of depth without the need for 3D glasses. The depth can be adjusted with a slider found to the right of the screen, or turned off completely to play games in 2D. It was released in Japan on February 26th, 2011, Europe on March 25th, 2011, the United States on March 27th, 2011, and Australia on March 31st, 2011. It costs US$169.99 in North America, €169,99 in Europe and £169.99 in the United Kingdom as a result of an August 2011 price drop. It is the handheld counterpart of both the Wii U and the Nintendo Switch, with graphical capabilities likened to that of the Nintendo GameCube, with better 3D modeling than the GameCube, but more pixelated due to the lack of texture filtering. The system was initially available in two colors, Aqua Blue and Cosmos Black, with further iterations such as Flame Red, Pearl (Misty) Pink and Midnight Purple released later. An Ice White 3DS (bundled with Super Mario 3D Land) was released in Japan on November 3rd, while a Cobalt Blue version bundled with Luigi's Mansion: Dark Moon was released in North America on November 28, 2013. Three exclusive models inspired by Mario, Princess Peach, and Toad were also made available to Japanese, European, and Australian Club Nintendo members. Later hardware revisions such as the 3DS XL also received Mario-themed models, including a Year of Luigi version released in Japan. The 3DS console has a similar appearance to that of the Nintendo DS, but builds upon its features. It includes three cameras, one being inward and the other two being outward, that are used to shoot 3D pictures, merge them, record 3D videos and play camera based games (see AR Games). The console, much like its predecessors, features the four , , and buttons, the and buttons (which are embedded below the touch screen) and the and shoulder buttons. Two new additions to the console are a Circle Pad located above the , which has been shifted downward, and the button, first used with the Wii console, used to access a HOME menu that is similar to that of the Nintendo DSi. The console also has wireless connectivity, which is used to connect with other consoles via local play or StreetPass, or to the Internet to download expansions for the console or play with people from around the world, for example. Online expansions include friend lists, sharing game content with friends, paid downloadable content for games (an example is New Super Mario Bros. 2 having additional Coin Rush packs) and firmware updates. A Nintendo 3DS comes with a 2 GB SD card, a Nintendo 3DS XL or Nintendo 2DS come with a 4 GB SDHC card, and a New Nintendo 3DS or New Nintendo 3DS XL come with a 4 GB Micro SDHC Card. However, any SD or SDHC card can be used and with appropriate adaptors, if necessary and compatible. The package includes a charging cradle along with the standard charging cable (which is the same as that of the DSi, and consequently is compatible with the DSi as well). The battery lasts three to five hours (calculated with minimum settings) while playing standard 3DS games; battery life is affected by brightness, 3D level, and wireless connectivity. To fully charge the battery, it takes approximately three and a half hours, so there is an energy saving mode that can be activated to slightly increase the battery life. When playing DS or DSi games, the battery lasts about 5-8 hours due to some hardware being disabled like the pedometer and HOME Menu. The Nintendo 3DS features limited multitasking. Software in use can be suspended with the button any time the software is open (except occasionally during online play) in order to change the screen brightness, switch to another software, check the Friend List if friends are online, browse the Internet, post to Miiverse, organize the HOME menu and check notifications from StreetPass and SpotPass. StreetPass allows the console to send and receive title data with other consoles within a certain range when it is in sleep mode. Up to twelve titles can have StreetPass activated at once. A notification light on the 3DS turns green to indicate when StreetPass data has been exchanged. The StreetPass Relay update allows for StreetPass data to be exchanged near official Nintendo Zone hotspots. One 3DS can StreetPass the same spot or same other 3DS once every eight hours. SpotPass also allows data exchange but differs from StreetPass in that it requires an Internet connection to be used. A notification light on the 3DS turns blue to indicate when such data has been downloaded. The system is backwards compatible with both DS and DSi games. When in DS mode, the 3DS simulates a DSi instead of an original DS so any DSi enhanced games will be given additional features for them to utilize. As with the DSi, Nintendo DS games that used the original DS's Game Boy Advance slot cannot make use of extensions, which the 3DS lacks. However, select Game Boy Advance games were released on the console's Virtual Console service on December 16, 2011, as part of the Nintendo 3DS Ambassador Program, which allowed people who purchased a Nintendo 3DS before the aforementioned price drop to download twenty free games, 10 of which were from the Nintendo Entertainment System (NES) and the other 10 from the Game Boy Advance. Despite the "Virtual Console" label, the GBA games are not emulated in software; instead, the 3DS interprets the code natively. This is the reason GBA games on the 3DS lack the ability to put the console in sleep mode or support Restore Points. The Game Boy Advance Games have not yet been released to the general public, and Nintendo has announced there are no plans to release them, either. The 3DS also features enhanced language accessibility. The system is the first Nintendo console to have Portuguese and Russian system language settings and the first Nintendo handheld console to feature a Dutch setting. All these languages are included on the PAL version of the 3DS, and the Portuguese language is also included on the American version. Mario games also began being translated into these languages (except Brazilian Portuguese). The 3DS is the first Nintendo system to be rated by PEGI and the ESRB (receiving a 7+ and E rating, respectively) due to the built-in games, including Face Raiders, AR Games, and StreetPass Mii Plaza containing 3D images which could cause damage to eyesight for anyone below the specified age groups. The Step Counter works by using the 3DS's motion sensor to count the player's steps when the 3DS is closed. Every 100 steps gives the player one Play Coin, which can be used in the AR Games, StreetPass Mii Plaza, and compatible games (e.g. Animal Crossing: New Leaf or Super Smash Bros. for Nintendo 3DS). Players can receive a maximum of ten Play Coins per day and can hold a maximum of 300 on the 3DS system. Additionally, every step is logged in the Activity Log. 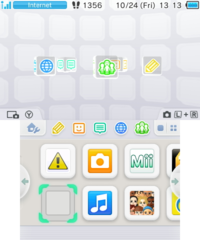 In the Version 9.0.0-20 Update for the 3DS released on October 6, 2014, brand new themes were added onto the system for the users to customize their HOME menu. Users were given 5 starting themes, each a different color, with additional themes available for purchase in the new Theme Shop. Additionally, since another theme related update, users are able to set a "shuffle" like mode via Theme Settings where the user can set any themes into up to ten slots, so each theme is set to their HOME Menu to switch out every time they power on the 3DS, put it into sleep mode or open a 3DS applet. For this subject's image gallery, see Gallery:Nintendo 3DS#Themes. The Nintendo 3DS XL (Nintendo 3DS LL in Japan and iQue 3DS XL in China) is the second version of the Nintendo 3DS handheld announced by Satoru Iwata in a Nintendo Direct video on June 22, 2012. Similarly to the Nintendo DSi XL, the 3DS XL has larger screens: the upper measuring 124 mm (4.88 inches) and the lower measuring 106 mm (4.18 inches), both being 90% larger than the standard Nintendo 3DS screens, making it tied to the New Nintendo 3DS XL as the biggest screen on a Nintendo handheld so far. The resolution, however, is the same. The 3DS XL also has been given rounded corners and digital , , and buttons instead of the embedded ones found on the Nintendo 3DS. The handheld also sports a single color job instead of the dual color job of its predecessor (black in the interior of the lid and a second main color overall), although it may also come with dual colors. Additionally, it is packaged with a 4 GB SD card, and the battery has been optimized to last longer. It lasts about 3.5 to six hours when playing 3DS games, compared to the three to five hours of play on the original version. The handheld was released in Japan and Europe on July 28, 2012, in North America on August 19, 2012, and in Oceania (bundled with an AC adapter) on August 23, 2012. In Japan and Europe, the handheld does not come with a battery charger, but can use the original Nintendo 3DS/Nintendo DSi charger. The handheld has its own charger in North America, but it does not include the charging cradle packaged with the original 3DS. Nintendo of Japan has announced that they are planning to discontinue the Nintendo 3DS XL model in Japan. The Nintendo 2DS is the third version of the Nintendo 3DS handheld and is part of the Nintendo 3DS family. Like the rest of the Nintendo 3DS models, it can play all Nintendo 3DS games and most Nintendo DS games; however, unlike the rest of the Nintendo 3DS models, it cannot display 3D images (hence the name) and is more sturdy, that make the system friendly for kids 6 and under, and both screens are touch-sensitive without a hinge separating them, with the top screen protected by a layer of plastic, while it features a tablet design rather than a clamshell design, making it the first handheld system since the original Game Boy Advance system to have a tablet design. The system's box includes a Nintendo 2DS, a Nintendo 2DS stylus, an SDHC Card, a Nintendo 3DS AC Adapter, and the six AR cards. It was released in North America, Europe, and Oceania on October 12th, 2013 at a price of $129.99 in the United States, €129.99 in Europe, and £129.99 in the United Kingdom in order to increase sales of upcoming 3DS games. The 2DS was released in Japan on February 27, 2016, at a cost of approximately 9,980 yen. Reception of the Nintendo 2DS has been mixed. The Nintendo 2DS has a single speaker with monaural sound output as opposed to the dual speakers with stereo output on the 3DS. Stereo output is supported on the 2DS via the headphone port. Sleep Mode works the same as on the 3DS models but it's activated differently. Because the Nintendo 2DS cannot be folded closed, a Sleep switch was added to the bottom-right corner of the console. Sliding this switch to the right causes the 2DS to enter sleep mode while sliding it to the left wakes up the system. Even though the Nintendo 2DS cannot display 3D images, it is equipped with stereoscopic 3D cameras on the back of the console like all other models on the 3DS family. According to the user's manual, the purpose is to allow 2DS users to share photos via the SD card with 3DS users who can then view those images in 3D. There is no Circle Pad Pro compatible with the 2DS. The New Nintendo 3DS and New Nintendo 3DS XL (New Nintendo 3DS LL in Japan), announced on August 28, 2014, were the first hardware upgrades for the Nintendo 3DS line of systems, similar to the Nintendo DSi. They were released on October 11, 2014 in Japan, and on November 21, 2014 in Oceania, and in North America (XL model) and Europe on February 13, 2015. The original/smaller model released in North America on September 25, 2015. On January 6, 2015, selected European Club Nintendo owners were invited to buy New Nintendo 3DS Ambassador Edition, a special pre-release bundle of New Nintendo 3DS, for €199.99, with orders shipped as early as January 7, 2015. In addition to having a more powerful CPU, the New Nintendo 3DS features an improved 3D effect, using the system's gyroscope and cameras to track the location of the player's eyes to sustain the 3D effect. An NFC sensor is built-in under the bottom screen, allowing compatibility with the amiibo line of products without needing the stand peripheral. Two additional shoulder buttons (ZL and ZR) have been added, alongside the C Stick, a second smaller Circle Pad positioned above the , which shares a similar function with the Circle Pad Pro when added to a standard Nintendo 3DS or 3DS XL. The and buttons have been moved under the buttons, similar to the Nintendo DS Lite and DSi. In addition, the cartridge and stylus slots have been moved to the bottom of the handheld, and the SD card slot has been replaced by a microSD slot on the back of the system which can be accessed by removing the bottom cover. The New Nintendo 3DS models also feature removable back covers on the backs of the top and bottom screens, which can be replaced with custom covers purchased separately. The New Nintendo 3DS also features some changes to the Internet application in that it can now play HTML5 videos. Japanese New Nintendo 3DS models have a web filter pre-activated which can only be removed by paying 30 yen, but the preactivated filter is absent on non-Japanese models. Certain titles, such as the port of Xenoblade Chronicles, are exclusive to the New 3DS systems, and are incompatible with any of the older models. SNES games including Super Mario World have also been released exclusively on the New 3DS's Virtual Console service. 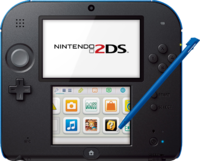 The New Nintendo 2DS XL (New Nintendo 2DS LL in Japan), announced on April 27, 2017, is a revision of the Nintendo 3DS released in Oceania on June 15, 2017, Japan and South Korea on July 13, 2017, and in Europe and North America on July 28, 2017. As the name implies, it shares the same clamshell design, size and enhanced CPU capabilities as the New Nintendo 3DS XL. Like the Nintendo 2DS, however, it cannot display games in 3D. The New Nintendo 2DS XL also includes the C-stick, ZL and ZR shoulder buttons in the same button layout, but, unlike the New Nintendo 3DS XL, the front-facing camera and microphone are now positioned on the hinge of the New Nintendo 2DS XL, like the Nintendo DSi. The New Nintendo 2DS XL was released in a Black + Turquoise color scheme in North America, and in two color schemes in Japan, Europe, and Oceania: Black + Turquoise, and White + Orange. The White + Orange color scheme was later released in North America on October 6, 2017. The Nintendo 3DS stylus differs significantly from the previous models. It is a single, metallic silver and black color, and extendable up to 100 mm (3.94 inches) for the user's comfort. The stylus is stored in a slot on the back of the 3DS. For the Nintendo 3DS XL and Nintendo 2DS, the stylus more resembles the original Nintendo DS stylus, being a single, solid color and removing the extension feature on the normal model. The stylus for these versions is stored on the side of the handheld, similar to the Nintendo DS Lite/DSi. The Circle Pad Pro is an extra accessory marketed as enhancing 3DS gameplay controls. As the name implies, it has an extra Circle Pad positioned on the right-hand side, as well as additional Zl and Zr shoulder buttons on the back. The whole combination is bundled onto a cradle which fits into the bottom of the 3DS, just as the charging cradle does. It is only available in Cosmos Black. The Nintendo 3DS XL has also been given a Circle Pad Pro add-on, which functions identically to the normal version. Also like the normal version, the 3DS XL Circle Pad Pro is only available in Cosmos Black. Only a few games are compatible with the Circle Pad Pro. The functionality of this device has been incorporated into the New Nintendo 3DS as a circular nub (called the C-Stick) and integrated ZL/ZR buttons. The Mario Kart 7 wheel is a specially made wheel developed by peripheral manufacturer Hori . The product is marked with the Official Nintendo Seal and fits snugly onto the back of the console. Its function is identical to that of the Wii Wheel. Like the Circle Pad Pro, the Mario Kart 7 wheel is only available in Cosmos Black. The 3DS stand is a Nintendo-made peripheral which holds the 3DS for players while playing any game. It comes bundled with Kid Icarus: Uprising and thus was released on March 22, 2012 in Japan and March 23 in North America and Europe. It is also available for purchase separately in Japan. The stand allows the user to have more comfort when playing the game, particularly during sections in which the touch screen is in heavy use. The stand can also be folded down, making it compact and easy to transport. Masahiro Sakurai, the director of Kid Icarus: Uprising, stated that the Nintendo 3DS Stand is useful for games that use both the Circle Pad and the touch screen at the same time. amiibo are a series of toys-to-life accessories by Nintendo that can be scanned into games using near-field communication technology to add content into games. Originally released for Wii U, Nintendo 3DS systems later received amiibo compatibility. Compatibility with original Nintendo 3DS systems require an NFC Reader/Writer that wirelessly transfers data via infrared communication, the accessory was released on July 30, 2015 in Japan and Fall 2015 in other regions. New Nintendo 3DS systems feature a built-in near field communicator, activated by placing an amiibo on the Touch Screen. Super Smash Bros. for Nintendo 3DS is the first game on the system to incorporate this feature. The bottom screen of the Nintendo 3DS menu, showing various software. Systems in the Nintendo 3DS family feature a variety of software, including software pre-installed onto the system in addition to software that can be purchased at retail and/or Nintendo eShop. Despite the stereoscopic 3D display being a major feature of the systems (with the exceptions of the Nintendo 2DS and New Nintendo 2DS XL), select software designed for these systems (such as Ultimate NES Remix and Super Mario Maker for Nintendo 3DS) cannot be displayed in 3D at all. The Nintendo 3DS Camera is an application that allows users to take photographs and videos in glasses-free 3D. Some photos can have a decorated effect with the in-game tools like Dream. The videos can last up to ten minutes. 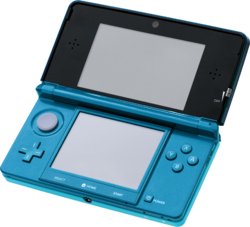 Nintendo 3DS Sound works similarly to the function previously seen on the Nintendo DSi. Players can record sounds with a duration of ten seconds and store them in the console or on an SD card. Player can also add music into the SD card and, unlike in Nintendo DSi Sound, the music can be in either MP3 or AAC format. A limit of one hundred music files can be stored in the default folder as well as in any additional folders, though there is no limit to the number of folders that can be created so long as there is enough memory on the SD card. In addition, any recorded sound less than five seconds in length can be attached to a Swapnote. The Mii Channel on the Wii makes a return with minimal changes as Mii Maker. However, there is a new feature in which the 3DS camera takes a photo of the player and converts it to make the photo look like a Mii. This feature is not automatic. Players must select the Mii's gender, hair color, and eye color before being prompted to take a picture of either themselves or another person. Players are then able to leave the Mii as it is or to make any modifications they may deem necessary with new customization options (hairstyles, eye shapes, etc.). Players can also connect to their Mii Channel and import any Miis found there to the 3DS. To connect the Mii Maker to the Wii, the player must press the , , and buttons on the when on the Mii Channel. Holding down the button for a period of time afterward makes a "Connect to DS" icon appear (if it is not present already). The player is also able to save their Mii as a QR Code, and save the image to the system's SD card. Players who then scan these codes with the Nintendo 3DS Camera will then receive the corresponding Miis. Creating a Mii in the Mii Maker. An example of a Mii QR Code. This code can actually be scanned in this state; hold up the 3DS to the screen. One of the most notable features of the 3DS, it allows players to create a profile represented by a Mii. When the player closes his or her 3DS system at any time, even when the StreetPass Mii Plaza is not open, walking past someone else who also has his or her 3DS closed (and StreetPass activated) enables each of the profile Miis to appear in both of their Mii Plazas. Seven games can be played in the Plaza: Puzzle Swap, StreetPass Quest (Find Mii in North America), StreetPass Quest II (Find Mii II in North America), StreetPass Mansion (Monster Manor in North America), StreetPass Battle (Warrior's Way in North America), StreetPass Squad (Mii Force in North America) and StreetPass Garden (Flower Town in North America). The three former games are immediately available when a user buys a Nintendo 3DS but the four latter games cost an additional $5.00 (4.99 euros) apiece, but the 4 can be bought for $15.00 (14.99 euros). In Find Mii and Find Mii II, Miis are utilized to fight their way through several enemy-filled rooms. Mario-themed accessories such as character caps can be obtained and later be used to dress up the Miis. When another 3DS is detected, its profile Mii will join in on the game. In Puzzle Swap, players exchange pieces of various different Nintendo-themed puzzles in order to complete them and unlock three-dimensional images. The Nintendo 3DS supports augmented reality games through the built-in application AR Games. The system is released with a total of six AR Cards that are used primarily in this feature, having a minor role in Mario Party: Island Tour, among other games. In Nintendogs + Cats, using the Mario AR Card enables the player's pets to wear Mario-related hats. The Question Block Card can be used to play games, while the five Character Cards included can be used to take 2D or 3D photos. The 3DS camera is required to play the games, as it must be aimed at the AR Card at all times to read it. Upon reading the Question Block Card, a menu of games appears, including Archery (Shooting in Europe and Oceania), which uses the aiming reticule that is used to open the AR Games, AR Shot, in which the player uses a snooker stick to hit a ball onto a teleporter, Mii Pics, in which the player can take a picture of his or her Mii, Star Pics, which is the same as Mii Pics, but the player uses one or more of the Character Cards, Graffiti, a drawing apparatus, and Fishing, in which the player uses a fishing line to catch fish. There is also a shop which is unlocked after playing any three of the games, in which the player can buy new features and games using Play Coins. Face Raiders is a built-in game for the 3DS that utilizes the 3DS cameras, which is required to make enemies in this game. At the first playthrough, only the inner camera can be used to take pictures of the players' faces. After their first playthrough, players may utilize the outer cameras to take pictures of other people's faces, or they can take another one of their own face by swapping the inner and the outer cameras. If desired, a player can even use a face from a photograph, even if it is online. The objective of this game is to shoot down floating heads of whatever face picture is taken. The game uses the gyroscope and the outer cameras to play, which makes players shoot down faces while rotating their bodies. It also appears as if they are shooting faces in their current location. New levels can be opened after players complete a level; three levels are unlocked by this method. Each level has its own set of enemies with different attack patterns. Butterflies and bombs appear; butterflies restore HP while bombs give users a chance to blow up all enemies on the screen. At the end of a level, a boss fight ensues. Players must exploit the weak point of a boss to defeat it. All bosses have different weak points and different methods of attacking. After the boss is defeated, the player completes the game. Gameplay of Face Raiders using Baby Luigi's head. The first boss using Luigi's head. The second boss using Wario's head. The third boss using the head of game show host Bob Barker. The final boss in Armor. The final boss using Mario's head. The Nintendo eShop (initially called Nintendo 3DS Shop) is a feature that allows players to buy software titles, including Virtual Console and DSiWare for their Nintendo 3DS with Nintendo 3DS prepaid cards or credit cards. It also allows Game Promotion. The eShop is similar to Wii Shop Channel and was released with a firmware update on the evening of June 6th, 2011 in North America and on June 7th in other regions, along with the Internet Browser. At GDC 2011, it was also announced that "3D Classics" would be made available for download in addition to the regular titles (Game Boy, Game Boy Color, and NES titles). These games, while 3D-compatible, retain their original graphical styles. Other than purchasing content, users can view information on current and upcoming 3DS titles (most notably through monthly episodes of Nintendo Show 3D, which provides footage of and commentary on popular or notable releases) as well as the Staff Pick of the Week (a Virtual Console or DSiWare title). If desired, users can also purchase and play a variety of "Quick Plays," including popular games such as Bejeweled and Solitaire. Continuing a practice established on the Nintendo DSi, content purchased from the eShop is transported to the 3DS Menu in the form of a gift that must be unwrapped before use. In addition, users are able to purchase downloadable content for their existing games. As of the December 9, 2013 update, a Nintendo Network ID is required to download free and demo software from the Nintendo 3DS eShop. In addition, the player can link their Wii U Nintendo Network ID to their 3DS and vice versa to combine eShop funds on both systems into one. Nintendo Zone is a feature that enables users to, once in participating public locations, view screenshots, watch 3D videos, download and play game demos, access the eShop, play compatible games online, browse the Internet, and receive SpotPass content. In the August 2013 Nintendo Direct, StreetPass Relay Points were introduced. When players visit a Nintendo Zone location, their StreetPass data for certain games is temporarily stored at that location and can be received by another player who visits that location and has the same games. Nintendo Zone was discontinued in North America on July 16, 2015 but StreetPass Relay functionality remains operational. The Activity Log allows users to view the amount of time they have spent playing certain game titles. It can also show the time spent playing each day, week, month, and year, as well as showing the number of steps the players have taken. It also has a catalog, called a Software Library, that shows what games have been played on the Nintendo 3DS. The Game Notes tool allows players to use up to 16 panels to make annotations or make simple drawings while other applications are suspended. Only a pencil option and an eraser option are available, though users can switch the pencil color between black, blue, and red. Any annotation can be saved and stored in the Nintendo 3DS Camera. A view of the suspended application is available if the player wishes to take notes on a game. From the Friend List, players can see their own friend codes and manage the register of other Nintendo 3DS owners they have added as friends. If their friends have the wireless feature of their consoles turned on, users can see the last game they were playing or the last application they were using. If friends play a game that has online capability, such as Mario Kart 7, and users own the same game, then users can join that game and play alongside their friends. Notifications provide users with various alerts that can be received while the console is in sleep mode. When an alert is received, the notification light, located on the front of the console near the button when closed and between the two screens when open, glows a certain color depending on the alert. If the alert is SpotPass-related (e.g. news or a software/application update), the light glows blue, and a blue circle appears on the software/application/feature that sent the alert. If the alert is StreetPass-related, it glows green, and a green circle appears on the software/application/feature. If one of a user's friends registered in the Friend List is online, the light will glow orange (it will flash orange if one of them is playing a game the user can join), and an orange circle appears on the Friend List icon. Finally, if the console's battery is close to being depleted, the light will glow red and flash. The Internet Browser uses the Yahoo! and Google search engines; users can choose which of the two to use at any time. The browser used is Netfront Browser NX. Users can type queries into a search bar or click the URL option to type in a web address. The Touch Screen is used to scroll through pages, which are divided between the top and bottom screens. While it does support a variety of web standards (HTML 4.01, XHTML 1.1, CSS 1, CSS 2.1, CSS 3 (some), DOM Levels 1-3, ECMAScript, XMLHttpRequest, and Canvas element (some)) and image formats (MPO, GIF, JPEG, PNG, BMP, and ICO (some may not be displayed)), the browser does not support any type of plug-in (e.g. Flash). The New Nintendo 3DS makes some changes to the Internet Browser. Videos can now be played inside the application. A more controversial addition is the Internet filtering feature, enabled by default in Japan, which can only be removed with a credit card purchase of $0.30. An Easter egg can also be accessed when opening a new page: if the player taps to the rhythm of the first six notes of the Super Mario Bros. theme on the touch screen, "Most Visited Bookmarks" will change into "STAGE SELECT". If the player selects one of the bookmarks, they are then able to play a Breakout-style minigame. Implemented during the update on December 9, 2013 (PST), Miiverse was a social network based around Nintendo Network allowing users to post and share information with each other on games or other software. Originally only on Wii U, a Nintendo Network ID was required in order to fully use Miiverse; this could be done by either linking a Wii U ID to the 3DS, or by creating a new one if the user does not have one. Super Smash Bros. for Nintendo 3DS was the only Mario 3DS title that had full Miiverse integration. The game used this to post photos from in-game. On November 7, 2017, at 10pm, Pacific Time, Miiverse was discontinued. Nintendo Video is a video series available via the Nintendo 3DS eShop and, formerly, a free downloadable application. It enables the 3DS to display videos in 3D. Using the SpotPass feature, players can receive and view movie trailers, comedy clips, and music videos, all specially selected for their 3D functionality. It was available in Japan, Europe, Oceania and North America starting July 13, 2011 (July 21, 2011). Like the eShop, the app updates regularly. Users can have a maximum of four videos at a time, one of which is deleted with every update. However, starting October 20th, 2011, Nintendo released previously deleted videos on the eShop in North America, where they can be purchased as permanent additions to the 3DS menu. The Nintendo Video app was terminated in Europe on April 4, 2014, in Japan, Oceania and some countries on March 31, 2014, and in North America in 2015. Swapnote (called Nintendo Letter Box in Europe and Oceania) is a free, downloadable messaging service that allows users to write notes (up to four pages) via the stylus and send them by StreetPass (and previously by SpotPass) to people registered in their Friend Lists (in the case of StreetPass, notes can be given to people who may not be on said list). Users can reply to each note once, and replies are restricted to one page. As users send notes to their friends, they gain access to a variety of features, including the ability to attach photos stored in an SD card, to create messages and art displayed in full 3D, to change the stationery on which notes are written, to view notes in a slide show format, and (using 15 Play Coins) to attach sound recordings from the Nintendo 3DS Sound application. The software can store a combined maximum of 3,000 notes and replies, and each note can have a maximum of 100 replies attached to it, with new notes/replies replacing old ones once this limit is reached (notes given "Favorite" status are not deleted, though replies are). An update for this software was released on July 5, 2012 in Japan, Europe, and Oceania which adds the feature to change the ink's colors by pressing either to the right or left, with North America receiving the feature shortly afterward. An April 2013 update allows users to use different colors of ink on each page in one note and added some more features to the software, such as the ability to delete multiple notes at once. On October 31, 2013, Nintendo suspended the SpotPass functionality of Swapnote in all regions, due to incidents in Japan where the app was used to share explicit content with minors, not only affecting interaction between users but also halting the reception of special notes and stationery from developers. A sequel released on November 17, 2016 known as Swapdoodle retains similar elements from Swapnote (except photo and sound attachments) with new features. There are now Doodle Lessons for players where they can practise drawing, along with stamps and secret pages. The application is free-to-start with in-game purchases. Photos with Mario (known as いっしょにフォト スーパーマリオ Issho ni foto sūpāmario, Photo Together with Super Mario in Japanese) is a photography application compatible with special Mario-themed AR cards, developed by the same teams behind Super Mario Galaxy and Super Mario 3D Land. The application and first cards were released in Japan on April 23, 2013, and the other cards were released on June 29; in North America, the application and cards were released on May 18, 2014. This application allows the player to scan a compatible eShop gift card that has Mario, Princess Peach, or Goomba on it and the player can take photos and watch the characters interact with each other. Nintendo Badge Arcade is a free-to-start application available from the Nintendo eShop for the Nintendo 3DS. The game involves collecting badges in various Nintendo-themed crane-game minigames, which can be used to customize the 3DS HOME Menu. It was first released in December 2014 in Japan, and later in November of 2015 in Western regions. The stereoscopic 3D effect provided by the 3DS has been subject to concern among consumers, forcing Nintendo to place a 7+ label on the system and its game boxes, the first in Nintendo system history. The stereoscopic 3D effect may contribute to visual stress to children's developing eyes and may cause a variety of symptoms including fatigue, nausea, headaches, dizziness and eyestrain. Warnings are frequently scattered throughout the games themselves; for example, Super Mario 3D Land frequently advises the player "Don't forget to take a break when you feel tired". To reduce disorientation from the 3D, the effect can be adjusted with the slider or even turned off altogether. Parents can disable 3D, preventing children from using it unless a passcode is provided. At a Nintendo World Store event near launch of the 3DS, Nintendo provided a warning saying that the 3DS's 3D mode should not be used by children six years and under. As a result, the employees at the event forced young children to play demos exclusively in 2D and even enforced this rule by having parents stick a special sticker featuring Toad on their children before allowing them to play. Later on, this act was justified as a means of providing information and protecting the system against lawsuits. Nintendo 3DS Home Menu - The music that plays in Home Menu. Nintendo 3DS Friends List - The music that plays in Friends List. For this subject's image gallery, see Gallery:Nintendo 3DS. This is the first Nintendo handheld console (not counting the Nintendo DSi) since the Game Boy Color to not feature a Mario game on its launch date. This is the only system whose Mario Tennis game was released before its Mario Golf game. ↑ 19 January 2011. Nintendo 3DS brings a dimensional shift to the world of entertainment on March 25. Nintendo News. Retrieved 4 November 2011. ↑ Vuckovic, Daniel (February 7, 2011) Nintendo 3DS Australian Launch Event details and live blog. Vooks. Retrieved 4 November 2011. ↑ 5.0 5.1 IGN - Nintendo reveals 3ds Xl. ↑ Nintendo To Discontinue Older Nintendo 3DS XL In Japan. Siliconera (November 30, 2014). Retrieved December 2, 2014. ↑ Sickr (August 29, 2014). New Nintendo 3DS Console Coming to North America and Europe in 2015. My Nintendo News. Retrieved August 29, 2014. ↑ New Nintendo 3DS Ambassador Editions Already In The Hands Of Lucky Buyers. Nintendo Life. Retrieved January 7, 2015. ↑ No Internet Browser ‘filter’ in Australian New Nintendo 3DS models. Vooks. Retrieved January 7, 2015. ↑ Nintendo. (April 27, 2017). New Nintendo 2DS XL portable system to launch in Australia & New Zealand on June 15!. Nintendo.com.au. Retrieved April 27, 2017. ↑ Nintendo. (April 27, 2017). Newニンテンドー2DS LL 紹介映像. YouTube. Retrieved April 27, 2017. ↑ Nintendo. (April 27, 2017). New Nintendo 2DS XL - Announcement Trailer. YouTube. Retrieved April 27, 2017. ↑ Nintendo. (April 27, 2017). Introducing New Nintendo 2DS XL. YouTube. Retrieved April 27, 2017. ↑ Nintendo. (September 13, 2017). Nintendo Direct 9.13.2017. Youtube. Retrieved September 13, 2017. ↑ Nintendo (Nintendo of America). (April 1, 2015.) Nintendo Direct 4.1.2015. YouTube. Retrieved May 26, 2015. ↑ Notice about service for Nintendo 3DS software Swapnote Accessed November 1, 2013. This page was last edited on April 15, 2019, at 22:24.